On Chinese-ilab.com we offer you the tools necessary to learn Chinese yourself. It is the most comprehensive website with a rich variety of materials for all media learning platforms. Learn Chinese As You Go! Download mp3 files and carry on your ipod/mp4/mp3 devices. You will quickly learn useful phrases and words in Chinese. The Chinese lessons on Chinese-ilab.com come on several varieties. These lessons are designed to careter for all learning styles. If you are the visual learner who must see to learn, then the videos offer you the best chance of learning Chinese. If you are the audio-lingual learner, then the audio lessons will do just fine. However, since most people are of the audio-visual learning type, then the videos with their audio will serve most well.Then we have the kinesthetic type of learner. These are people who must touch to learn. That is why we have the interactive games and quizzes to go with each lesson. 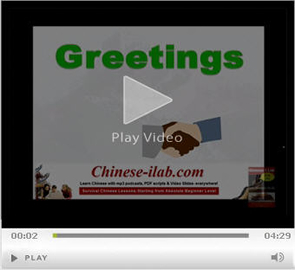 Watch and learn Chinese with highly instructive video slides.